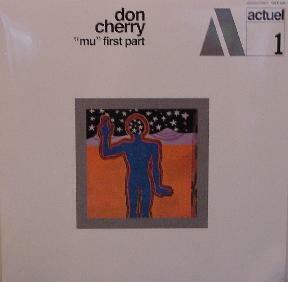 Don Cherry / Ed Blackwell - "MU...First Part"
When first released in 1969, these records (part 2 hasn't been released yet) were warmly received by the Jazz community. Again GET BACK have again outdone themselves, reissuing the first part on 180 gram vinyl, and have included a laminated cover which seems indistinguishable from the original. This is a switch from the botched-up identical covers of most of the BYG catalogue that Affinity reissued in the late 70s/early 80s. By 1969, the works of both Don Cherry and Ed Blackwell were well-known, Cherry having come into prominence through his work on seminal recordings by Ornette Coleman, John Coltrane and his own Blue Note LPs (check the excellent "Where Is Brooklyn" LP). Blackwell had also worked in Ornette's groundbreaking early '60s ensembles, and had drummed for everyone from Nina Simone to Ray Charles, and he was widely recognized as a drum instructor and percussion theorist. "MU" was recorded in Paris, and is a deeply moving example of the use of the duet form in Free Jazz. The improvisations played by these musicians are strongly rooted in the Classic forms of New Orleans music (in Blackwell's melodic swinging march beats), and the Be-bop derived harmelodic experiments conducted by innovator Ornette Coleman (in Cherry's bubbling Pocket Trumpet lines, and rhythmic piano work, and Indian inspired Vocals) The most interesting musical ideas here, however, come from both men's interest in and understanding of some of the Non-Western and Ethnic musical traditions found on our planet. Parts could be characterized as some of the roots of the bastardized/commercialized "New Age" (New wage?) genre that's exploding these days. The multi-ethnic character of the music also belies many of the charges used to denigrate the 60s Jazz Avante-Garde, as all sorts of melodies and rhythms explode in joyous celebration as the players react to and IMPROVISE with each other. This is a record for opening the blinds and windows of your house, and letting fresh air and sunshine in; a true masterpiece, and I'm eagerly awaiting Part 2. Bravo GET BACK, we want the all of this important label's works reissued with such care. Maybe even you could pay the surviving players who recorded for Claude Delcloo and were never properly compensated (at least see that they get copies; meanwhile, how about releasing the BYG Cecil Taylor Units, and the Archie Shepps as well.